One of the main reasons I love to escape to the woods is to simply unplug. No ringing phone, no emails, no text messages, just quite. That said, you can't just wander around without a plan and you want to get back to camp before nightfall. Having a dependable timepiece is a necessity in the back-country, unless you can tell time by looking at the sun (yeah, not that talented). 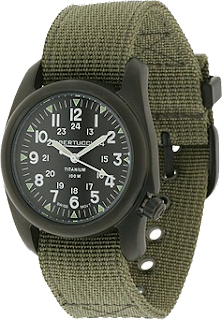 Bertucci has designed and built a line of field watches with the outdoors enthusiast in mind. Rugged and accurate, you can't ask for a whole lot more. I gave the A-2T Vintage a try and I am thoroughly impressed. The matte titanium case is waterproof to 100 meters, and nearly unbreakable. Utilizing a classic military design, the bars/lugs are solid and integrated into the case so you have no chance of popping a pin and losing the watch. The Swiss made movement keeps perfect time. I have been checking it against the official US atomic clock, and it has been right on for over a month. 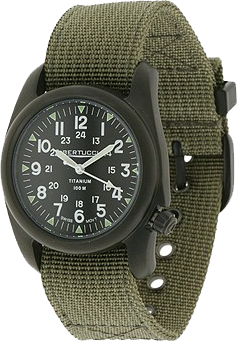 The watch came with two bands to choose from, the green 2-ply nylon (pictured) and a grey Tri-Dura that feels like suede. Simply slide one band out and the other in, no need for tools of any kind. Also included was a Pro-Guard, a high performance elastomere dial guard that also slides on without tools, that adds even further durability to an already tough watch. Bertucci produces 10 watch models with countless color and band combinations, so you can find the one that fits your needs and style. Every watch available has been built for the woods, but are cool enough for the street.